Roger Shew teaches Physical Geology 101 (Labs and Lab Coordinator), Environmental Geology 120, Oceanography 150, General Petrology, Earth Materials, HydroGeology, Issues in Geoscience, Subsurface Methods and Petroleum Geology, and Sedimentology/Field Methods, and in the Environmental Sciences Dept. 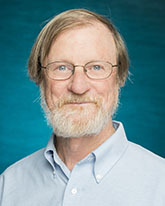 he teaches Topics and Issues in Sustainability and Environmental Field Methods. He also conducts field seminars for UNCW and Industry on topics ranging from siliciclastic depositional models, geophysics, and resource geology. He does outreach to schools with presentations and field trips for both teachers and students working closely with CSTEM and the Watson School of Education. Roger's geologic background is in sedimentology, stratigraphy, sedimentary petrology, subsurface methods (core, log, and geophysical interpretation), resource geology, and science education. He is involved in studies of coastal issues and processes and surface and groundwater sources and quality in southeastern North Carolina. He has provided input on discussions of offshore energy resources (having worked in the energy industry), coastal hazards, and water resources. An additional area of current interest is geoscience and environmental education. He works with numerous groups on a wide range of projects including the design and construction of BMPs for stormwater runoff and on studies of threatened ecosystems, endangered species, restoration projects and mitigation, superfund sites, and water quality. He is on the Sustainability Committee of UNCW and on the Boards of Cape Fear River Watch and the Cape Fear Conservation Collaboration. His goal is to combine teaching, research, and outreach for the benefit of the community.